Milne Bay has a total 203 cases in the criminal track and about 56 civil matters for 2018 reveals Alotau resident judge Justice Peter Toliken at yesterday's launch of the legal year 2018. Toliken says it’s heavy and there’s a lot that needs to be done to address these numbers. He says, "Of the 203, we've got 40 people on bail, 113 on remand and 50 on bench warrants. The bench warrants are a big number and I urge the community to do their part, it is within your right and your interest to ensure these people are brought to court. Assist Police, assist CS and assist the courts". Justice Toliken says it’s the only way they can resolve the crime rate experienced by Milne Bay as it is. He reminded the public, its their peace that will be affected and that it was in their best interest to work with those upholding the rule of law to address law and order issues they face. 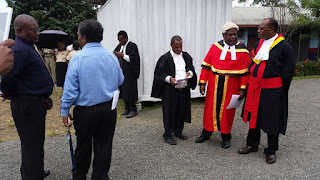 Meantime, he reveals the most common cases before the national court for Milne Bay are sexual offence cases, about 62 of the 203 criminal cases, about 40.5percent of their active list. Toliken says second to that is homicides, 58 cases are currently before him, about 38.9precent of total cases and there’s 43 armed robbery cases before him making up about 28percent of total criminal cases in the province. He highlights grave concern that over 50percent of the 62 sexual offenses before him involve child victims. He says, "These are our children we ought to protect. And the disturbing thing is that people who abuse children and who have come before the courts are people who are mostly in positions of trust. Fathers, uncles, we have had serving village court magistrates convicted of persistent sexual abuse, we have had retired and serving pastors convicted of this aberrant crime against our children". Meantime, Justice Toliken is understood to have conducted a visit to the CS Giligili Prison on Thursday, a first one since the last such visit conducted in 2005.